Venturing 369 senior associate advisorAndrew Drake, center, helps Richie Collins, left, and Lucy Beagleproblem solve during a computer course on Unix at the ReformationLutheran Church Thursday. Venturing Crew 369 of the local SimonKenton Council of Boy Scouts of America has the third best of the 100Web pages among troops in the country. 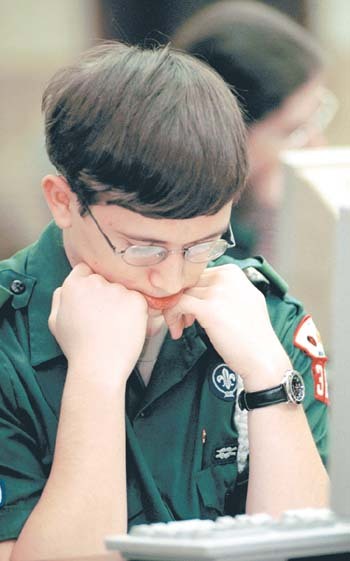 When James D. Corder achieved Eagle Scoutstatus as an 18-year-old, he was a little depressed. Although he was still interested in Scouting, there seemed to be no mountains left to climb, no trails left to hike. But Corder moved on from his momentary sadness to become involved in the Exploring end of Scouting, and later moved on to leadership positions. Today, in his 31st year of involvement with the Boy Scouts of America, the Gahanna resident is Adviser to a Crew that provides a perfect melding of 21st-century career ambitions and the ideals espoused by Boy Scouts founder Lord Robert S.S. Baden-Powell. Venturing Crew 369 of the Boy Scouts ofAmerica, Simon Kenton Council, is a co-ed youth mentoring program open to those between the ages of 14 and 21. So far, that sounds pretty much like anyother Troop of Scouts in central Ohio. "We are definitely different," insisted Adviser Corder, who founded Venturing Crew 369 in 1994. The chief difference is the group's primary area of concentration, which can be summed up in four letters: UNIX. According to Webster's New World Dictionary of Computer Terms, UNIX refers to "an easy-to-use operating system developed by Ken Thompson, Dennis Ritchie and co-workers at Bell Laboratories. Since the UNIX operating system is very easy to use,its design concept had a great influence on operating systems for microcomputers." The young people who participate in Venturing Crew 369's weekly meetings aren't just learning how to use computers that employ this widly used operating system. They build virtually all of the computers they use, and they have created one of the best Web sites among all of the thousands puton the Internet by Scouting groups throughout the world. In fact, Crew 369's site was rated third best, by topsite, among a list of hundreds published on www.cubscout.net. The local group's site has over 4,000 images online in 1,000 pages, Corder said. The site received 2.4-million"hits" last year, a figure any for-profit Web site would be envious of, the Adviser indicated. Many are computer users who return to the site time and again. "It's called stickiness," Cordersaid. The skills Venturing Crew 369 members acquire during their time in the group stand them in good stead in computer crews, the adviser said. In fact, he added, there is a three-year waiting list to hire graduates of the program. "Our kids are well-known," Corder said. Participants are learning to be systems administrators, web developers, technical writers, and more importantly IT Leaders not just computer users, he pointed out, and that's a type of training for which there is currently a high demand. One 18-year-old program participant landed a job paying $80 an hour, according to Corder. Most can look forward to earning at least $25 an hour, he said. Corder maintains that a six-figure income is easily achievable for someone with the knowledge a Venturing Crew 369 participant can acquire, if they are willing to work hard. The young people in the group don't just put together award-winning Web pages. They create a local area network at the outset of each weekly meeting in the Reformation Lutheran Church on South Hamilton Road, tearing it apart at the end of the evening, Corder said. They also cobble together the computers they use from equipment donated by hospitals, banks and major corporations. "These are all professional-quality machines," the adviser said. Venturing Crew 369, in spite of its look to the future, still has some ties to traditional Scouting activities. "The typical camping is never going to goaway," Corder said. "That's still fun for the kids." Increasingly, though, he sees career-oriented activities as the driving force behind membership in the organization. Venturing Crew 369 members come from allover central Ohio, according to Corder. In fact, last year one member made the weekly trip from Portsmouth in order to participate. Heather Ward of Upper Arlington is the current president of Venturing Crew 369. "I would say most of the people I know think they know computers," Ward said. These people don't really know computers.Venturing Crew 369 members KNOW computers, according to Ward. As important as the technological expertise the participants acquire, she added, is the leadership skills they develop as part of the program. "It's great knowing how networking works, how the Internet really works," said Aaron Croyle, vice president of Venturing Crew 369. A native of the Cleveland area, Croyle is currently a student at Ohio State University. He credits participation in the Scouting group with having help him land his current job working with computer security people at the university. The job, Croyle said, involves "tracking down hackers and crackers." The latter are the bad guys, Croyle said, people who worm their way into computer systems with an eye toward committing "malicious" damage. Hackers, on the other hand, are those invited in to test the security of a system. Although he is leaning toward specializing in system administration, the college student finds his current line of work highly intriguing. "Security and privacy's definitely entertaining now," Croyle.